Djibouti, officially the Republic of Djibouti, is a country in the Horn of Africa. 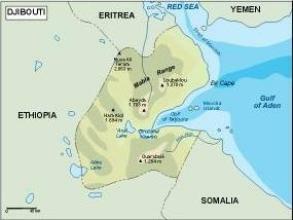 It is bordered by Eritrea in the north, Ethiopia in the west and south, and Somalia in the southeast. The remainder of the border is formed by the Red Sea and the Gulf of Aden at the east. 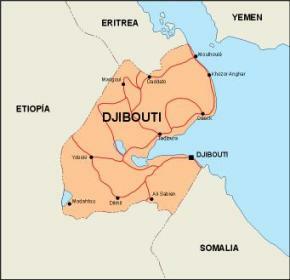 Djibouti, which had a population of 800,000, is one of the least populous countries in Africa. 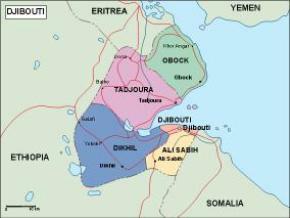 The land was known as Obock and French Somaliland (Côte française des Somalis) in the 19th century; in 1967, it changed its name to Afars and Issas after new treaties with France. 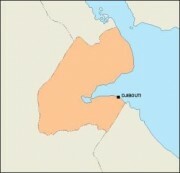 The territory was declared an independent nation in 1977 and changed its name to the “Republic of Djibouti” after its principal city. 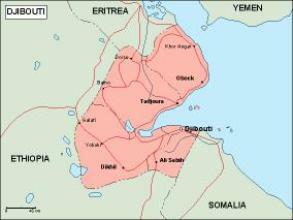 Djibouti joined the United Nations on September 20, 1977. 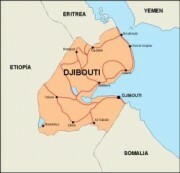 While Djibouti is an independent sovereign state, it maintains deep French relations, and through various military and economic agreements with France.